The NFL has a history of handing down controversial punishments for players convicted of domestic violence. Some players have been suspended for a handful of games, while others have received only a slap on the wrist from the league after official charges were reduced. Although many have long taken issue with these seemingly arbitrary—and inadequate—punishments, the controversial case of Baltimore Ravens’ Ray Rice brought the issue of domestic violence and the NFL straight into the spotlight last year. So what do Americans feel the punishment for players convicted of domestic violence should be? According to the new PRRI/RNS religion and sports survey, a majority think convicted players should be punished by the league in some way. Nearly one-in-three Americans (29 percent) say that a football player who has been found guilty of domestic violence should be permanently banned from playing in the NFL. Nearly 6-in-10 (59 percent) Americans say that a player who has been convicted of domestic violence should be temporarily suspended but allowed to return, and only about 1-in-10 (8 percent) say that no formal action should be taken by the league. There are sizable differences in views by race and ethnicity. More than one-third (34 percent) of white Americans and 28 percent of Hispanic Americans favor a lifetime ban for professional football players found guilty of domestic violence, while majorities of each group (55 percent and 61 percent) favor a temporary suspension. In contrast, only 12 percent of black Americans support the NFL banning such players, while 76 percent say these players should face a temporary suspension. And how do Americans feel about teams taking on a player who has been convicted of domestic violence in the past? 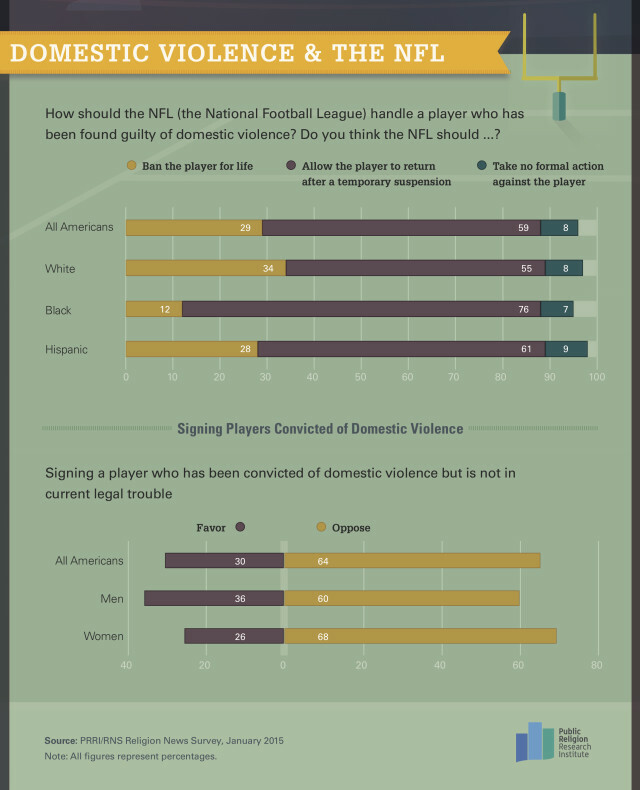 Roughly two-thirds (64 percent) of Americans say they would oppose a professional sports team signing a player who was convicted of domestic violence but is not facing any current legal trouble, while three-in-10 (30 percent) Americans support a team signing such a player. There is a noticeable gender gap on this issue: men are more likely than women to express support for a professional sports team signing a player found guilty of domestic violence (36 percent vs. 26 percent). But despite this desire for stronger action from the league, Americans’ love for football endures. Americans are nearly four times as likely to say football is their favorite sport to watch (40 percent) as they are to say the same about any other sport, including baseball (11 percent), basketball (12 percent) and soccer (8 percent). They’re also more likely to tune into Sunday’s big game than not—72 percent say they are very (49 percent) or somewhat (23 percent) likely to watch the Super Bowl, while a mere 27 percent say they are not too (18 percent) or not at all (9 percent) likely to watch.